Sudanese authorities have arrested a powerful militia leader suspected of human rights abuses in the Darfur region. Musa Hilal was detained after fighting with Sudanese forces near his hometown in North Darfur, state media reports. He is a former ally of Sudanese President Omar al-Bashir and led the government-allied Janjaweed militia. Musa Hilal is subject to UN sanctions for his suspected involvement in the Darfur conflict of the mid-2000s. His son Habeeb was also detained in the clashes in North Darfur, Sudan's defence minister, Lt Gen Ali Mohamed Salem, said. "They were arrested after clashes in the area but the security situation there is now stable. They will soon be brought to Khartoum," Gen Salem added. 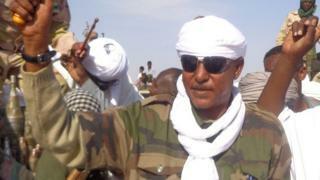 Musa Hilal was appointed as an adviser to President Bashir in 2008 but they later fell out. His fighters have often clashed with Sudanese forces in Darfur. The latest fighting started on Sunday when Sudanese troops were ambushed as they oversaw a handover of weapons under a disarmament campaign, the Sudan Tribune reported. Sudan's Rapid Support Forces said they lost 10 members, including a commander. Musa Hilal has refused to surrender the weapons held by his militia and has also declined mediation to resolve the dispute, the report adds. The Darfur conflict erupted in 2003 when black African rebels began attacking government targets, accusing Khartoum of favouring Arabs. In response, the mainly Arab Janjaweed militia was accused of carrying out a policy of ethnic cleansing and genocide against Darfur's black African population. Arrest warrants against President Bashir were issued by the International Criminal Court (ICC) in 2009 and 2010 on charges of genocide, war crimes, and crimes against humanity in Darfur. The conflict claimed at least 300,000 lives. He denies the charge and has evaded arrest. Will Sudan ever find peace in Darfur, South Kordofan and Blue Nile?